A stock chart shows two curves. One, labeled "Our Stock Price", remains flat. The other, labeled "Their Stock Price", goes up by 8000 per cent from left to right. A rectangular screen, presumably a TV screen, shows two human figures. Figure 1: Hi, I'm a Mac. Figure 2: And I'm a PC. The next panel shows a building with trees growing in front of it. Voice from building: We were outmaneuvered in smartphones and tablets. 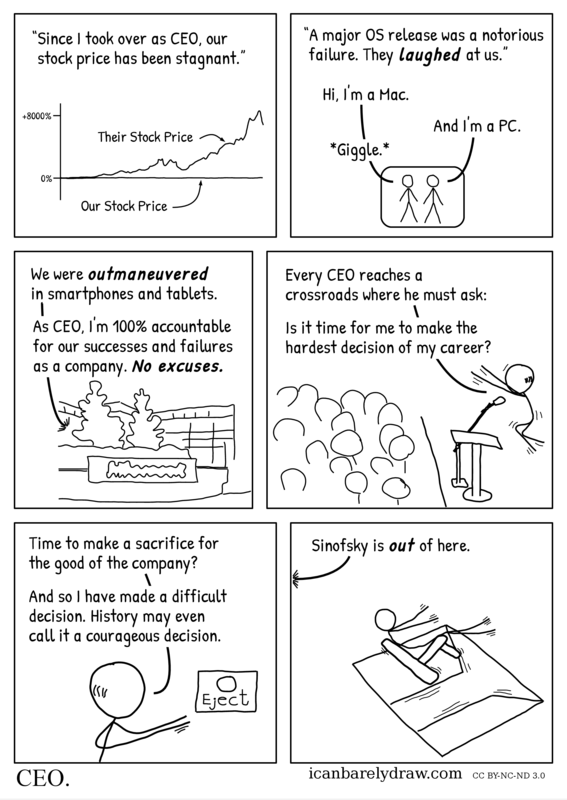 Voice from building: As CEO, I'm 100% accountable for our successes and failures as a company. No excuses. The next panel shows a man jumping up near a lectern and a microphone. An audience is in attendance. A stub of hair on the back of the man's head suggests that he is mostly bald. Man: Is it time for me to make the hardest decision of my career? The next panel shows the same man in a closer view. Man: Time to make a sacrifice for the good of the company? Man: And so I have made a difficult decision. History may even call it a courageous decision. The man appears to be reaching for a panel on which a button labeled "Eject" is seen. In the next and final panel, an off-panel voice says: Sinofsky is out of here. A man seated on a chair is seen gesticulating with both arms and legs while he and the chair fall down backwards into a half-open trapdoor whose doors are opening.